New Zealand and Fiji have expelled each other's top diplomats in a deepening political row. New Zealand's acting high commissioner in Fiji has reportedly been asked to go; in return Fiji's high commissioner to New Zealand will also have to leave. 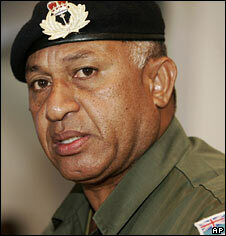 The row stems from a decision by Fiji's military leader, Frank Bainimarama, to delay plans for democratic elections. Mr Bainimarama, who seized power two years ago, says he wants election laws to be reformed first. New Zealand and Australia - the region's political heavyweights - have headed international pressure on Mr Bainimarama to return the nation to democratic rule as soon as possible. Both countries have banned any member of Fiji's defence forces as well as government officials and their families. The latest spat began when the son of a senior Fijian official was refused a student visa to study at one of New Zealand's universities. The response has been swift. Minister in Wellington say Mr Bainimarama has ordered Caroline McDonald, New Zealand's acting high commissioner, to leave Fiji. Fiji's interim Attorney General Aiyaz Sayed-Khaiyum did not specify why Ms McDonald had been expelled, but told reporters the decision was made with "deep regret and reluctance". New Zealand Foreign Minister Murray McCully said that any allegations Ms McDonald had acted inappropriately were false, and there was no basis for the action against her. "The New Zealand government can't deal with these discussions with a gun pointed at its head," Mr McCully said. The government in Wellington has retaliated by expelling Fiji's most senior diplomat, Ponsami Chetty. Frank Bainimarama has accused his larger neighbours of employing "bully-boy tactics". He has insisted that Fiji's "racist" electoral system must be reformed and corruption stamped out before power can be returned to the people - and has therefore postponed the elections which were due by next March.